Well what do we have here, bargain hunters!? If you thought all the best sales had passed now that Black Friday and Cyber Monday are behind us, you would be sorely mistaken. 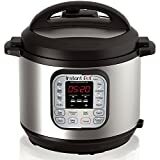 The Instant Pot DUO60 6 Qt 7-in-1 Multi-Use Programmable Pressure Cooker is the single best-selling Instant Pot model on the planet, and it’s back on sale at its Black Friday price of $69.95. That’s a big 30% discount from its normal $100 price tag, and trust us when we tell you that it’s not going to last very long.